Found in Celtic art throughout Ireland, the overlapping circles of this simple sterling silver knot are a symbol of strength and unity—the knot itself has no beginning or end. Paired with a faceted birthstone, it’s a thoughtful gift for a friend or loved one to symbolize the timelessness of your connection. January/Garnet, February/Amethyst, March/Blue Topaz, April/White Quartz, May/Green Quartz, June/Mother-of-pearl. Bottom row, left to right: July/Carnelian, August/Peridot, September/Blue Lapis, October/Opal, November/Citrine, December/Turquoise. 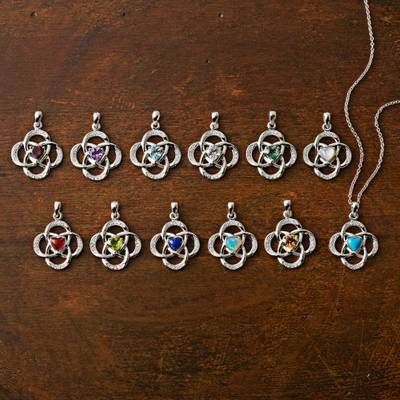 You can find birthstone pendant necklace 'Celtic Knot' by National Geographic in jewelry categories such as Birthstone Necklaces, Celtic Necklaces, Gemstone Necklaces, Nat Geo Europe Necklaces, Nat Geo Gifts Necklaces, Silver Necklaces, Sterling Silver Necklaces and Pendant Necklaces. Enjoy exploring these sections for other Novica treasures. Christmas gift. Haven't given it to her, yet, but it looks really nice. I think she will like it.